These documents were issued to Sergeant Walter C. Kopp. Kopp, who lived in Harveyville, Kansas, served in France from June 4, 1918, to May 22, 1919. He was a platoon leader in France and was injured in a German mustard gas attack. The gas attack permanently damaged his throat and voice. The items in this collection include American Expeditionary Forces General Order No. 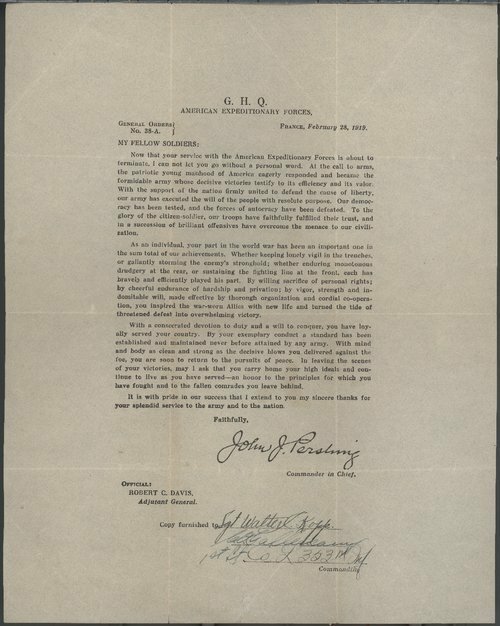 38-A, France, February 28, 1919, issued to Sergeant Kopp and stamped with General John J. Pershing's signature and a list of equipment to be carried in a pack and surplus kit issued to Company L, 353rd Infantry, Camp Funston, Kansas, May 5, 1918. Also included is a day pass for his mother Mrs. A. E. Kopp to visist him at Camp Funston.